Many objections may be raised against listing Yuktobanian-born Dominic Zubov among the ranks of Belkan aces. However, while information regarding him is spotty and extremely limited, the various bits and pieces together insist that Zubov is an ace pilot worthy of tale. There are no official records pertaining to the period during which Zubov was enlisted in the Yuktobanian Air Force. It appears that he was part of the 9th Division 112th Fighter Squadron during his Yuktobanian service: a squadron which ended the stalemate of the Tyumen Dispute which broke out on Yuktobania's southern border in 1986, as well as the suppressing the Kholm Regime coup d'etat in Romny the following year, at a heavy cost. In what is said to be the greatest battle of that war – the air battle over Zhytomyr – Zubov's squadron left the northern element of the Kaluga Republic Air Force in a state of near annihilation, despite losing 80% of their own combat aircraft. The battle was so fierce that the mental shock to the few pilots remaining from that baptism by blood was enough to lead to their medical discharge. The only one to keep his sanity was Dominic Zubov himself. His time as a professional soldier enlisted into the Yuktobanian Air Force was, in truth, quite brief. ​He drifted after his discharge from the Yuktobanian Air Force, fighting as a soldier of fortune for the Republic of Romny and Kingdom of Valka's air force. His wanderings finally brought him across the Ceres to the Belkan Air Force in 1990. The existence of so-called mercenary units in the Belkan Air Force was largely unknown, cast in the dark shadows of notions of purity of Belkan blood. Efficiency was what the Belkan Air Force pursued most in their strength as an organization, but one of their most important attributes was their use of mercenary units. Maintaining morale on the front line is a challenge for any military organization, and so too it was for the Belkan Air Force, which suffered from it acutely. The Belkan Air Force's strategy to combat this problem was surveillance missions along the front carried out by foreign mercenaries. While these surveillance missions sounded innocuous, in reality these were anti-retreat missions where they had unrestricted clearance to engage any deserting aircraft. The upper ranks of the Belkan military establishment were utterly opposed to making Belkans undertake missions to fire unhesitatingly upon their friends and allies; they were partially forced to form these organizations. In this context, one may catch a glimpse of the Belkan Air Force as an organization could not sufficiently adapt to the rapidly changing situation. An anti-retreat unit known alternatively by the alias 13th Night Fighter Squadron, or as a "special operations unit," participated in numerous top secret missions of which very few official records remain. Many say this reflects the intentions of the Belkan Air Force upper ranks who resisted officially recognizing the existence of anti-retreat units. During the time Zubov was with the 13th Night Fighter Squadron, the Belkan Air Force was rapidly bolstering their strength, and Zubov's unit contributed to it from the shadows. Much is told of Zubov's unique and mysterious career, but it is known that he held to a set of dependable tactics while in the air. He flew MiG-31s after moving to the Belkan Air Force, making straightforward use of its acceleration, and carrying out his missions with a cool demeanor. The battle records of his black squadron are not cast in glorious color. It's said his nickname of "The Vulture" did not come from merely fear but from scorn. However, if a man of the skill which led him to survive a career of countless aerial battles so bitter as to cause despair were to stand center stage, I cannot help but think that he has the potential to be included among the ranks of top aces. Zubov himself plotted to desert to escape becoming a war criminal. News of him ceased immediately afterwards, but he was shown to be surviving in Osea in a 2005 OBC investigative documentary. It is questionable whether or not the name Dominic Zubov is itself his real name. However, there can be no doubt that this man remains at large. One of Belka's ace pilots, Erich Hillenberand is perhaps better known by his nickname of "the Unkillable Man" than by by his TAC name "Phoenix." Hillenberand shot down 51 aircraft over the course of his career, and was himself shot down seven times. He was a pilot of singularly good fortune. The numerous medals carved into his body from the times he was shot down and escaped tell the tale of his unflagging luck. Hillenberand joined the Belkan Air Force in 1980. The academy he attended felt the influence of several forces within the military, it was part of his fortune that he was not marked by any specific faction, and that after continuing into the military he continued to not choose a side. While it was common sense that Academy graduates use cliques as support, Hillenberand continued down the path of becoming an ace pilot under his own strength and luck. Hillenberand was deployed to Curado Air Force Base on the front lines as requested at the onset of the Belkan War in 1995. He was assigned to the 22nd Air Division under the leadership of Lieutenant General Lerner Mainz (who gained notoriety as an ace pilot himself the previous year), and the division became known as one of very fine quality. The 4th Fighter Squadron under Hillenberand's command returned tremendous results between March and April 1995 on the southeastern front, where the main task was the suppression of Ustio. During that period, Hillenberand marked 6 kills for himself in an air battle which broke out over Monte Rosa against the Ustio Air Force (it's said that the 4th Air Division 2nd Squadron participated) on March 30th, and his name exploded. His kill score steadily increased, and on the other hand, Hillenberand is recorded as being shot down three times in three months. He returned to the front as time and time again this lucky man fell, and finally, having never given over his life, he survived the Belkan War. It is fortunate that he was not ambitious, for he escaped becoming a war criminal and retired from the military. He works at a civilian flight school as an instructor in Osean territory, taking up the education of pilots. The first Silber Team made a heroic impression with their results during the Recta Dispute. 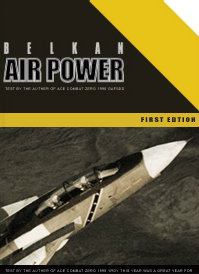 Recta's air assets, with whom conflict with the Belkan Air Force unfolded, lagged behind its neighbors in terms of numbers, but maintained a high quality, and the Belkan Air Force found itself beset by unfamiliar pressure. For a moment it seemed as though an endless war of attrition loomed on the battlefield, but it was Silber Team which broke the status quo. Kellerman's squadron snatched back air superiority over the airspace centered on the Mainz mountain region, where Recta previously held the initiative. Air superiority let Belkan ground forces regain their mobility, and ensured the success of their advance on the Recta Liberation Front held city of Cor. Behind Silber's battle record was its commander's precise command. It's said he would use his instructions of hitherto unknown clarity and conciseness sometimes to ensnare a target, and sometimes to effortlessly anticipate a threat diving on his formation. Continuing on to the incident where unidentified aircraft intruded into Belkan airspace offshore of Cresence Island to Belka's north in 1985 (the Wehle Incident), Silber Team – at the time deployed to the north – was scrambled, and records show the unidentified aircraft as being shot down after an engagement broke out between them. Kellerman, known as the Hero of Mainz for his work, earned qualification to be an instructor, and opted out of front line service in 1990. The 105th Fighter Squadron was known as the 2nd Silber Team from 1990 to 1995 in Kellerman's absence. The pilots of the squadron did justice to their former commander and instructor's teachings, and they maintained their high degree of excellence in exercises as aggressors against their comrades. With high recommendations from his boss at the time, Major General Heinrich Rand, Kellerman for the moment devoted himself to training new pilots as a flight instructor at the Air Force academy. However, his time as an instructor was brief. The skies of war called the old soldier home once again at the outbreak of the Belkan War in 1995. Unable to maintain the superiority of the opening phase of the war, as the front was breaking in various places, the upper ranks decided to send out Kellerman with the goal of improving morale in the ranks. However, since the second Silber Team members were almost to a man killed in action or injured, the Air Force sent him nothing but students who had not finished their training yet – pilots of the academy's 9th Special Program, commonly known as "Kellerman's Classroom." This was the inauguration of the third Silber Team, called the Squadron of Tragedy. On May 28 of that same year, in a large scale air battle with allied forces in airspace bordering Ustio, all aircraft were hit, shot down, and their pilots killed, with only Kellerman being spared (he was shot down but escaped with his life). The ones who destroyed Silber Team – a team not lacking in skill – are strongly theorized to be a mercenary squadron flying for the Ustio Air Force. The Belkan War came to its conclusion soon afterwards, but while he was treated as a war criminal, his punishment was light. There were intentions within the Osean air force to bring him in to lead the rapid organizational restructuring program that they were pressing ahead with at the time. However, Kellerman refused the request. He has been living his days in seclusion ever after.